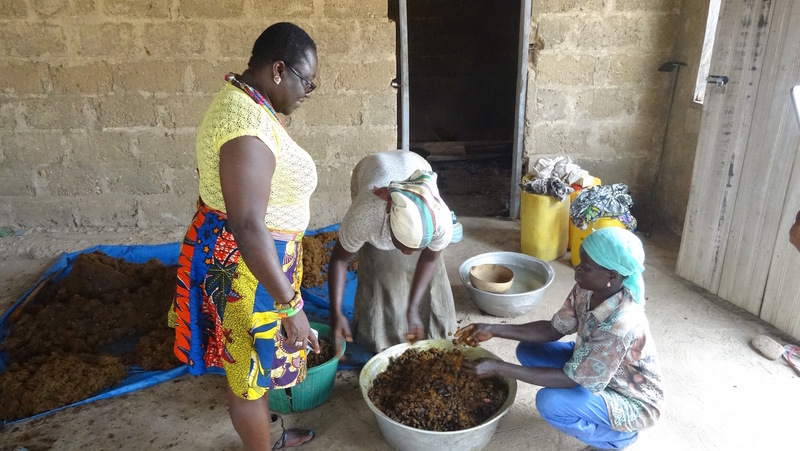 Our Kadjebi project tour included the Crossroads International Women’s Economic Empowerment projects palm oil and gari producing facilities. Palm oil was first up. The dry season made it rather quiet at the site. 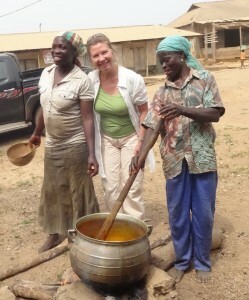 Three women showed us the equipment and Trudi asked them for a small batch to take back to Accra. The palm nuts had already been cooked in the outdoor steamer. We watched them being pressed with a hand-cranked press. 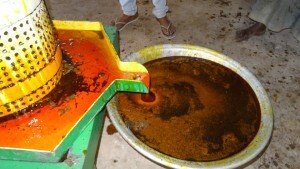 The resulting oil was then boiled to get rid of any remaining water. After cooling, it was poured into our empty water bottles. 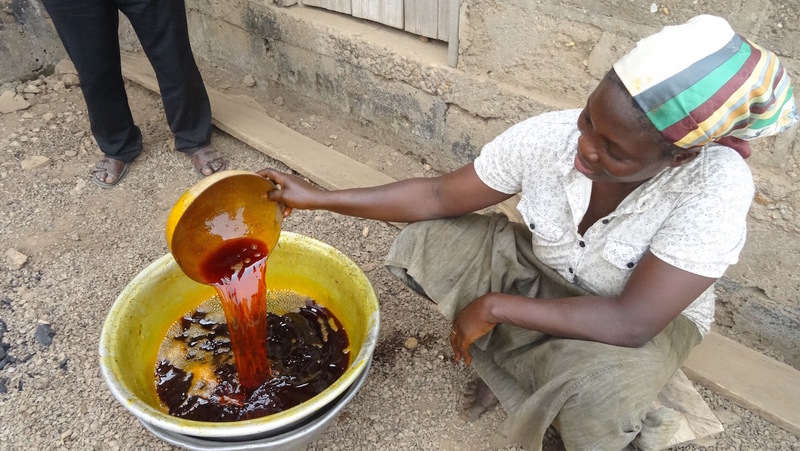 Recycle, reuse is a strong mantra in Ghana. The price was 8 cedis for 1.5 litres. 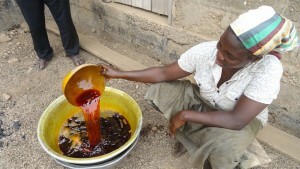 A very good price for this fresh, nutricious Ghanian cooking staple. 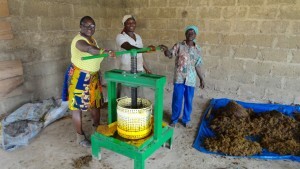 “Since the project began we can take better care of our children with the profits we make. Also, when I get home my husband helps with the cooking. We have a better relationship. There is a free flow of communication now. Before we were not on good terms but now he is less aggressive, less violent,” explained Cande Ibrehim. Final stop was the gari-producing group, also part of the Crossroads International Women’s Economic Empowerment project. Gari looks a bit like shredded parmesan cheese. 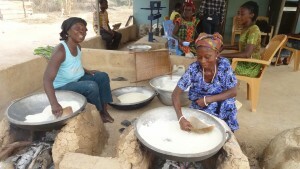 Cassava, a large, starchy tuber, is put into a giant grinder and then cooked over an open fire. Ghanaians put it into everything, adding crunch and fibre. Since it is dried, it can last a long time without refrigeration. I always ask for a sprinkle in my red-red, a rice and beans dish that is one of my favorites. Auntie Dorcas, head of the group, sat and chatted for awhile. The group has had good business from the local secondary school with more than 3,000 boarding students – orders can be up to 50 bags a week. 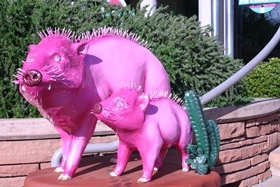 But they have faced a recent challenge. 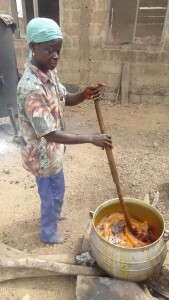 Hunters have been burning the bush to flush out wild animals – “bush meat.” Unfortunately, since it is the dry season the fires have been burning out of control. 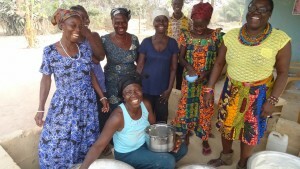 The women have been growing their own cassava at a nearby farm, but the crop was burnt. 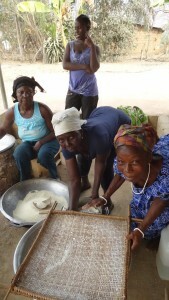 That meant they had to buy cassava from the market, eating into their profits. 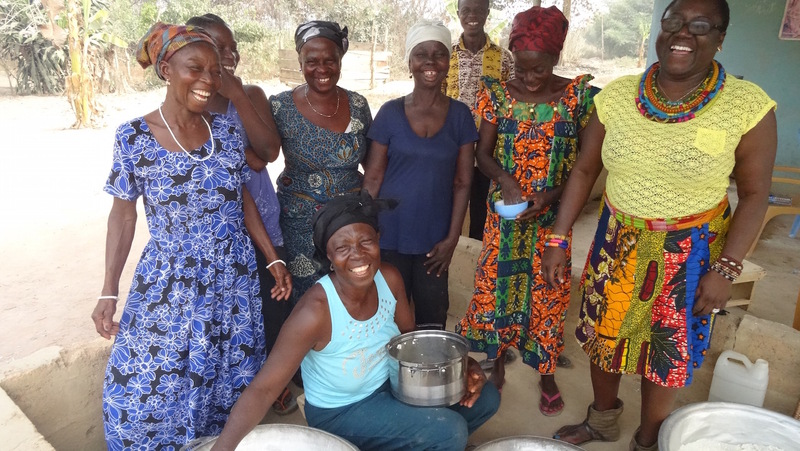 “We won’t be able to plant again until the rainy season,” Auntie Dorcas told us. Perhaps a bridge loan from Pro-Link could help them get through this rough patch. Mawusi was going to look into it. 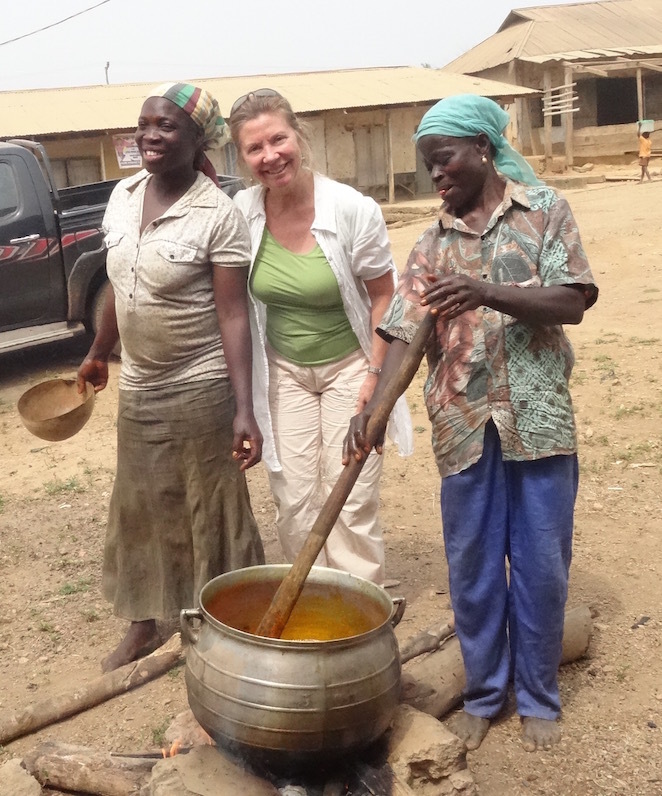 Loaded up with cabbage, garden eggs, palm oil, and gari, we headed about to Accra. Mr. Osei did yeoman duty, clocking in another seven hours behind the wheel and we got home at midnight. 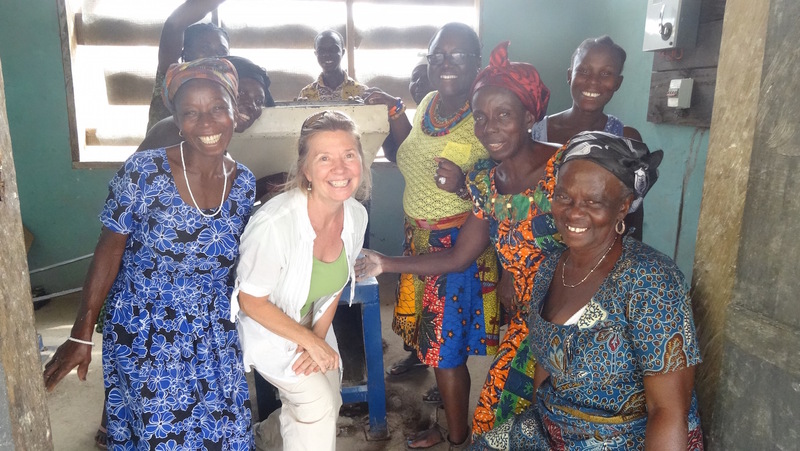 A wonderful trip, short but it allowed me to see Pro-Link’s rural projects in action —they really are making a difference and empowering women.